After so much pressure to induce, and at least a week or more of trying just about every old wives’ tale in the book to kick start labor, I finally went into labor on my own, the day after my due date. I was woken up around 4:30 a.m. on Tuesday, October 20th by a big gush of fluid. I ran to the bathroom to check it out, thinking that maybe my water had broken. While my underwear was pretty soaked, I didn’t really seem to be leaking any fluid otherwise. I knew that something was definitely happening, though, since I was having what felt like really bad, constant menstrual cramps. I went back to bed to lay down for a bit, hoping that this was it. I had an appointment scheduled for 9 a.m. that morning to go in for yet another round of testing due to my high blood pressure: a nonstress test, a blood pressure check, lab work to screen for preeclampsia and an ultrasound. I had been dreading the appointment, since I knew that I’d once again be facing tremendous pressure to be induced immediately. As I was lying in bed worrying about it, I felt another gush in my underwear and ran to the bathroom to check it out. This time, it was my mucus plug (which I’ve never noticed losing in previous births)—a big, goopy glob of slime in my underwear. (Nice, huh?) “This is it!” I thought, relieved, even though I knew all too well that losing the mucus plug didn’t necessarily mean that labor was imminent. At 7 a.m., I decided to call the birth center to see if I really needed to keep my 9 a.m. appointment. I talked to Eva, one of my favorite midwives, who agreed that I was probably in early labor and that we could skip the appointment for the morning, but that I should check in with her by phone at 11 a.m. to give her an update. She told me that she’d be on call ‘til the morning, and hung up saying: “I think we’ll probably see you in here tonight.” I was a puddle of relief, both to know that I was going to get the chance to go into labor on my own, and to know that Eva would be the one to deliver our baby if he was, in fact, going to come that night. We got Julia and Charlie off to school, and then I went for a long walk on the beach to try to get the contractions going. It was a beautiful, sunny fall day, with red and orange leaves on fire against a clear blue sky. “It’s a beautiful day to have a baby,” I thought to myself, while I listened to my iPod and walked and walked and walked, stopping every now and then to do some squats against a stone wall. The contractions were definitely kicking in, so I went home to take a shower, get things in order, and check in with Eva. She agreed that I could wait at home until I was ready to come into the birth center, and suggested that I check in with her every four hours by phone. My mom picked Charlie up from school and took him to the playground for a few hours so I could labor in peace and quiet at home. I spent several hours just listening to my music and alternating between walking around, leaning over the bed, and lying on my side to relax and keep my blood pressure down. Finally, around 3 p.m., I called Will at work and told him that it was probably time to come home. 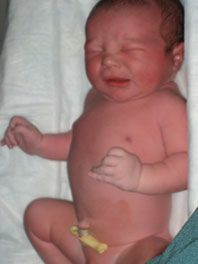 Eva had warned me that a third labor could kick into high gear unexpectedly, and not to wait too long before coming in. By 6 p.m., the “witching hour” was setting in at home, and my contractions were taking a decidedly stronger turn. Just as I was starting to get nervous that I’d be in transition while Will was trying to put the kids to bed, Eva called and said: “I think it’s time for you guys to come in now” and we agreed that it was. We kissed the kids goodbye and headed out for the birth center. When we got there, I was a bundle of nerves, thinking my blood pressure would surely be up, and that we’d be sent over to the hospital for the rest of the labor. Eva greeted us at the door, and then showed us to the birthing room with the gigantic tub—the one I’d been hoping for all along. We were the only ones there that night, much to my relief (apparently, the next day, the birth center was filled to the brim with women in labor and their families, so we were lucky to have the entire place to ourselves.) Eva let me lie down on my side for a while to relax while she monitored the baby for 20 minutes, then she gave me a 5-minute warning before checking my blood pressure. I concentrated on relaxing, breathing, letting go… and held my breath as she took my blood pressure and announced: “138 over 88!” Music to my ears. We were staying! It was all coming together: there we were at the birth center, in the room with the gigantic tub (I was hoping for a water birth), with my favorite midwife Eva ready to deliver our baby. It all felt too good to be true. Eva told us that her backup midwife that night would be Cricket (another favorite midwife of mine)—“the most laid-back labor team ever”— and I breathed a huge sigh of relief. I knew that I had another blood pressure check ahead, but for that moment, I had a good 4 hours to continue with labor at the birth center. It was 8:00 by then, and I thought: “Maybe we’ll have the baby before the next four hours are up!” But, when Eva checked my cervix “to see where we’re starting from” she announced “3 centimeters” and I could hardly believe my ears. “Seriously? !” I asked, dumbfounded. “After 12 hours of regular contractions?! Only 3 centimeters? !” I confessed to Eva how disappointed I was, and she looked at me and smiled and said: “I think I was being a bit stingy—it was probably more like 4.” It made me laugh, and I settled in for what looked like a long night ahead.